Posted byColin Mackay	 26 October, 2008 17 June, 2012 Leave a comment on Using a different map server with the Virtual Earth ASP.NET controls. This uses the July 2008 CTP of the Windows Live tools. You can download the Windows Live Tools for Visual Studio. One of the interesting features of Virtual Earth is that it doesn’t have to use the maps provided by Microsoft. You can set it up to point to another tile server so that you can use your own maps. This could be extremely useful for people who want to show static visualisations of data, or simply display something different to what Microsoft give you. Setting up the tile server is likely the more difficult part as setting up the client to point at a new tile server is incredibly easy. I’m not going into setting up the tile server in this post. <ve:Map ID="VEMap" runat="server" Height="600px" Width="600px"
As you can see there isn’t anything unusual here. There are no additional options to set. First of all, we are reducing the dashboard side down to its minimum because the particular tile server does not support the other features provided in the dashboard such as switching between road and aerial photography. Id: An identifier for you to use to identify the tile server, if you are using more than one. NumServers: If your tile server is load balanced then this specifies the number of servers. MinZoomLevel / MaxZoomLevel: This pair of parameters specify the the minimum and maximum zoom levels. 1=the whole world, 18 = street level. Opacity: How opaque is this tile layer. By default the Virtual Earth tiles are drawn first, then your layer is drawn on top. 0 is completely transparent (and a bit pointless) while 1.0 is completely opaque and will hide the layer underneath. At present you cannot turn off the layer underneath so if you only want to see your layer set the opacity to 1.0. This is because Virtual Earth ASP.NET controls are based on Virtual Earth 6.1. 6.2 is now released which does have the ability to turn off the base layers. ZIndex: Tile layers can be stacked on top of each other, this indicates the positioning of this layer in that stack. Visible: Indicates whether the layer is visible or not. The server for the tiles is http://tile.openstreetmap.org. 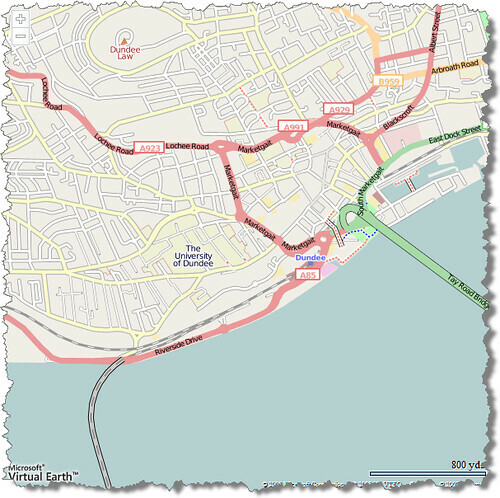 If you are unfamiliar with it, Open Street Map is an open source map of the world. The tile context also contains a map style property which can be “r” (road), “a” (aerial) or “h” (hybrid).